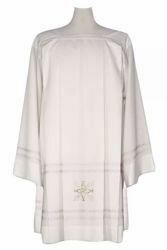 Wide selection of Liturgical Priestly Surplices, Clergy Surplices and Altar Servers Cottas, cheap or modern embroidered Surplices in fine white or ivory mixed cotton or mixed wool, available in many sizes with embroideries, folds and laces with Cross, floral and JHS symbols. Our clergy Surplices are designed and produced in Italy by the historical tailoring workshops Chorus Ricamificio Umbro and Felisi 1911 and other ecclesiastical tailoring workshops specialized in Liturgical Vestments. Liturgical Surplices, Cottas for priests, clergymen and altar servers, embroidered and finished by hand, with an excellent quality/price ratio. 100% Made in Italy. The Liturgical Surplices by the historic ecclesiastical tailoring Felisi 1911 are comfortable and durable, appreciated worldwide for top quality fabrics and care of the finishes. Sizes: cm 85/90/95/100/105/110/115/120/125 (inch 33,5/35,4/37,4/39,4/41,3/43,3/45,3/47,2/49,2). 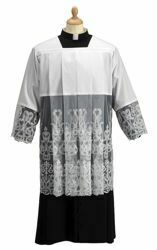 The size refers to the height of the Surplice. Liturgical Surplice from the prestigious Chorus catalogue of Sacred Vestments, produced in Italy by the historic Ricamificio Umbro. Sizes: cm 90/95/100/105/110/115 (35,4/37,4/39,4/41,3/43,3/45,3 inch). The size refers to the height of the Surplice.